Rheumatoid arthritis (RA) is a progressive inflammatory disease that primarily affects joints and often results in painful and deformed joints. It is a chronic autoimmune disorder the cause of which is not completely understood. RA affects between 0.5 and 1% of adults in developed countries. People of middle age are affected most often, but the condition can develop at any age. RA cannot be cured. Existing treatments (medication, physical therapy, etc.) can only help slow the progression of joint destruction and relieve pain. The treatment focuses on minimizing symptoms, maintaining day-to-day functioning, and preventing bone deformation. For most patients, current treatments cannot assure a healthy future. 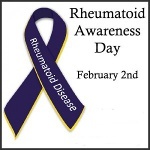 Rheumatoid Awareness Day was established to recognize people with rheumatoid disease and educate wide audiences about RA. The Rheumatoid Patient Foundation encourages people to get involved by promoting awareness messages, participating in relevant events, and sharing educational resources.